Two students came to my office last week to ask me about potential PhD projects. They have already decided to do a PhD, but most students often wonder whether a PhD is the right choice for them. Are you also approaching the end of your studies with no idea about what to do next? Do you doubt whether you have good enough grades to be accepted for a PhD? Or do you think that it may just be wiser to look for a job, especially in a time of financial uncertainties? If so, then read on. Being at a crossroads is not really much fun. I know because I have been there myself. At the end of my studies I also did not know what to do next, though my problem was not a lack of interests. If anything, I had too many. A writer, an actress, a teacher, an interpreter, a traveller, a scientist, an artist… these are just a few of the things I wanted to become. Now, looking from my present perspective, I realise that having become an academic has allowed me to be all of the above. When I put together a scientific proposal, a paper, or a grant application, I am a writer. When I present talks at international conferences, I feel like an actress on stage. When I give lectures or seminars, I am a teacher. And then, travelling extensively and learning three other languages have simply followed as a welcome by-product of all these activities. I like to think that the seed of all this was planted when I started my PhD. Yet, when I had to decide whether to do one or not, I was scared that I may not be up for it, or that I would waste three years of my life, or worse that I would quit half way through disappointing all the people involved. Luckily, a dear friend of mine came up with a great piece of advice. He simply said: “Forget about the others and take this opportunity to invest in yourself“. It was a major shift in my mindset and one that ultimately allowed me to get where I am. So, are you still in doubt if you should start a PhD? If so, here are the first five of ten good reasons for doing a PhD. 1) Drive for research. This is possibly the best reason of all. If you have experienced a sense of excitement while working at a project of your own during your undergraduate studies, chances are that you will enjoy the opportunity to focus on a problem of cutting-edge research. The rewards of contributing to advance knowledge in any given area can be amazing. 2) Becoming an expert in your area. This closely follows the previous point and it is almost an unavoidable consequence of working for three to four years exclusively on a specific topic. Whether you believe it or not, you will become an expert in your area (possibly even more than your supervisor!). 3) Enjoying the academic environment. If you suspect that you may enjoy the academic environment (intellectual stimulation, flexible working hours, mixture of lab and office work), chances are that you will. Of course, doing a PhD can be pretty tough, lonely, and frustrating at times (don’t panic, there will be plenty of advice and support even during the all-too-famous second-year blues! ), but ultimately the freedom and challenges that come with working in an academic environment may just make up for everything else. 4) Available opportunity. Say you have been offered a studentship. What to do? Just go for it. 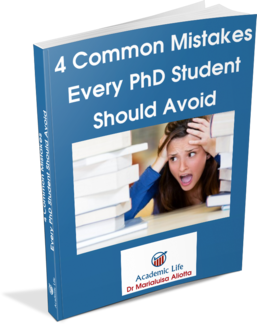 In the worst case scenario, even if you decide that research is not for you, you can still come out of your PhD with a nice Dr title on your credit card and a set of useful skills that you can employ in your next job. 5) Developing important transferrable skills. Here are some of the most obvious ones: you will learn how to solve problems; how to find relevant information; how to work independently and as a member of a team; how to communicate (by writing, by giving oral and poster presentations, by speaking in public); how to meet deadlines; how to manage your time effectively and how to prioritise your activities. All of these, of course, in addition to very specific technical and computational skills. No doubt it will all be incredibly useful no matter what job you will take up after your PhD. Interested in finding out what the other five good reasons are? Then, come back here for part II of this post. It will be published in just a few days. Many thanks Marialusia for your post. I was full of smiles reading your write up. I t really motivated me because it confirmed all I feel about doing PhD. Thank you. Wish I didn’t have to do a PhD. Only doing it since I was jobless and the scholarship pays me to do it, and didn’t want to be a parasite to my parents again. But I hate every moment of feeling trapped, in a country that is not yours, with a PI that has not time nor is good enough to explain what and why you need to do, in a field that I do not enjoy, with a model I personally hate, with a work flow that is way too complicated and strange for me, and being forced to do it for at least 3 years cause I can’t pay back the scholarship. Going back to academia after I was my own boss for my own small personal projects was a horrible decision that I was, sadly, forced due to the circumstances, and I barely find any usefulness to doing it considering I am an expert in my field and only needed some money to be independent. Wish things would have been different. Really sad to hear you are not enjoying your PhD. Of course if you feel it was not a choice but rather something you had to do, it is really difficult to find the inner motivation to keep going. If it can be of help, my advice would be to regard it as an opportunity to gain new skills, whatever they may be. Hopefully, in the great scheme of things, 3 years will go by fast and you’ll be able to move on with something else you enjoy more. Good luck, and let me know if I can be of help. I recently completed my M.tech my grades are good but i not a very studious person but like to do some research i think i am good at it.so I like to do phd but really confussed about many things like university from where i should do or which subject i should choose. and most of all i dont want to become a teacher. This arises a question, should i do phd? My advice would be to pursue a PhD only if you are genuinely interested in research and are passionate about some specific topic. Good luck! My case, I believe, is not the common one. I gave up my first bachelor about twenty years ago. Basically, I didn’t see the point of doing it. Experience afterwards told me that I was right by doing it. But, then, I was mid-twenties plainly with no education. I went to the job market and I was suitable to wash dishes, which I did and I hated. But, moving on, I worked on different fields till I found one that I was comfortable. Then, I began to study again. I got my BSc obtaining a first degree, then I decided to stop working to do a MSc which I just finished obtaining a Distinction. Now, I’m unemployed (I have been only one year off) and, suddenly, I have been offered to do a PhD in a topic that looks like it has been thought just for me. Indeed, I believe no other candidate can match the requirements better than me, unless age. I’m in mid-forties now, when I stopped to go for a MSc everybody looked at me like I was dumb. Same when I have commented about the PhD, it looks like everybody believes it is only useful if you are looking to fill an academic position. I do not feel overwhelmed by the work in a PhD, in fact, I know it is hard but try to wash dishes, however I feel vertigo. The topic is just an amplification of my MSc thesis which I chose because I knew the market gap. However I’m not a scientist no matter what my grades says (I saw easy to get them, well maybe MSc was a little bit harder but I think it was because I was away from many subjects for too long), and my mind works in the industrial path rather, let’s say that I can see easily what can work and what is just purely literature which, nowadays, is not giving a economic advantage. My MSc supervisor, who did nothing, was basically 14 years younger than me, he had never left the university walls, hence, I saw he could give me very little insight, adding that my personality takes over easily as I have been running teams for quite a long time in many kind of environments, then I decided the direction of my thesis (I even broke the university rules about thesis length which I pushed them to grant me complete freedom, doubling it comparing other students). I bear mediocre academic staff for a year, not all of them, but many disappointed me when I saw that behind the curtain was emptiness and greed. In fact, one lecturer stole one of my conclusions about a subject to write a paper in which he didn’t acknowledge any of the students who were part of the investigation. However, overall I have a positive approach to my last year doing the MSc, I learnt a lot and it has been quite helpful to see where we are heading. So I have been considering the PhD opportunity. But when I’ll finish I’ll be close to fifties. Everything is perfect but my age as it will be even full paid position. What I’m attracted is to do right a wrong doing in the industry by showing that the way they do this, which I have been doing for ten years, is based on money grabbing rather than efficiency taken from knowledge. Basically, the industry is taking advantage of new developments to justify the price increment rather than using this technology to use it in a more efficient way so that the costs can be reduced greatly. But vertigo, as I don’t know whether or not the PhD will be taking a different way because University can be more interested in data numbers rather than in solutions. Yes, your case is not the common one, but it’s also not completely isolated. I have seen other people going back to academia after long detours. You seem to have a strong motivation for doing a PhD. This is often all you need to succeed. I’d be interested in hearing how things will proceed. Best of luck! I recently completed my MSc., looking foward to a PhD. I have always been a brilliant student from time with good grades to show. somehow, i scored a C grade for my dissertation, and may consequently graduate with a Pass. I have the passion for research, but at this point I am doubting myself and my abilities because i feel downcast and discouraged, even though i know deep down in my heart I AM GOOD. please i dont know what to do. Follow your instinct and go for it. Only time will tell your real worth. Feel free to get in touch if you wish to discuss things further. I can confess the article as a true reflection of what i did, recently i had a nice paying job and decided to embark on my PHD program the whole of my collegues criticised me for laying off my work and go back as a student whilst i had a well paying job which some were unable to get. To cut it short i resigned yes in preparation for my program. I started with the institution, just one month after having started I received one of the prestigious scholarships which paid me a stipend double of what I was earning in my previous job and send me to an overseas university as an exchange student for the duration of my PHD period. I am now in the process of finalising my PHD I am not worried about money everything is paid for. Really the decision to pursue a PHD lies with your interest first and with the question of why do you want to pursue it and lastly where do you see yourself in 5 to 10 years. what drives you to pursue a PHD, is it money or intellectual growth. So these questions respond to your question. Great article indeed, I thank you for such a wonderful article. Marialuisa, thank you so much for such a nice and motivational article. I got selected for pursuing PhD at a Central University of India. But, looking into my core interest, i am passionate about teaching rather than in research. I am a bit confused about either to move forward for PhD or set up my own coaching center for teaching students of under-graduation. It’s a difficult call to make and only you can decide what is best for you. I can only add that a PhD will open up additional opportunities that also include teaching (for example, as a class or lab demonstrator) already at this stage. If you decide not to do a PhD at this stage you may not get another similar opportunity and may realise to have closed doors a bit too early. You can still set up your own coaching as a side activity and doing a PhD yourself would give you additional insights as to what students at various level struggle with. I hope this is helpful. Do let me know how things develop. 1) I have a job offer which will pay say 10,000 per month. 2) I have scholarship for Phd which will cover say 4000 per month. I am really confused what to do now because if I will continue my studies and go for Phd it will be great for my learning experience but I will not be able to safe any money and it will continue for 3 years atleast if I am lucky otherwise 4 years. On the other hand if I will go for the job, I will be able to safe atleast 5000 per month. Hence, when I compare the two circumstances by the end of next three years. I will have 5000 x 12 x 3 = 1,80,000 if I will be in the job. If I continue for Phd by the end of three years, I will be at the same point as now financially speaking. I am unable to decide and the time is running out. I am afraid to choose between the two. Please help me. Hi Asha, first of all congratulations for being in such a lucky position to be able to choose. I agree that continuing on a PhD is likely to be a less attractive financial prospect than taking up the job offer, at least in the near future. However, I think you should also take into account your personal preferences and circumstances. What are you passionate about? If money wasn’t an issue, where would your heart take you? Having a well-paid job that you don’t like is not much fun. On the other hand, pursuing a PhD just because you regard it as a ‘prestigious’ option may result in much frustration along the way. This is a very personal choice, but one I would advice not basing solely on financial grounds. Whatever you choose, I hope you it works well for you. Let me know and good luck! Thank you Marialuisa for this great and inspiring article. I have being going back and forth with myself regarding pursuing my PHD and its killing me. I’m always reminded that i’m too young and inexperience which doesn’t help either. So thank you for this. Glad to hear, Selam. Age is relative and experience is what you get by doing. Just follow your heart and aspirations. You’ll find a way. All the best! This post was incredibly inspiring. I have been in a very bad place lately, deciding what to do once my masters is over. However, it seems like you put down all the reasons I cannot make anyone but myself see as pros of PhD. Lorela, sometimes we just need to trust ourselves and not worry about the others. They may come to accept in the end. All the best for whatever decision you take. Really motivational post! I am about to start my PhD in the UK this year and, as an international student, I still have some doubts and concerns about the whole process but reading your posts has helped me a lot. I totally agree with your vision that being an academic allows one to develop multiple aspirations and vocations, which perhaps would not be possible in most careers. Thanks! Thank you, Jose, I’m happy to hear you found this post useful. Best of luck with your PhD and future career! Information very brief, but inspiring. Thank you so much. You’re very welcome. Glad to hear you found the post inspiring. You’re welcome. Thanks for leaving a comment. Thanks, E-bike! Glad you liked the post. Some universities allow you to pursue a PhD by publications only. If you have enough, and of good quality, this might be an option. Good luck!